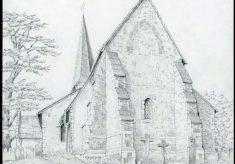 Original drawing by John Clark of the church of St. Nicholas in Compton. The drawing shows a side view of the church with the spire to the rear, drawn from a low angle. The brickwork and buttresses are clearly visible. Pencil on white drawing paper.